As with any marketing effort, every brand and organization will develop a unique mobile strategy based on the industry and target audience. Mobile technology is all about customization and personalization, which means mobile marketing is, too. To better understand your specific target market, monitor Google Analytics for your site’s mobile traffic numbers. You can also ask or survey clients and prospects about their mobile web usage. Both the general and specific data will help develop audience personas that include mobile usage. What are we currently doing for mobile? This will define your starting point, and make sure everyone is on the same page as you begin. If you are already doing mobile marketing, how are those initiatives performing? This conversation will identify what is already working, what is not, and what’s not even being measured. What are your main objectives for including mobile marketing in your overall strategy? Discuss why you’re considering mobile now, what conversations have led up to this point, and what you expect from mobile marketing. Who are your key audiences for mobile marketing? Talk about your customer personas in light of mobile usage updates. How similar or different is each persona’s mobile usage? How are you engaging your mobile audience cross-channel? This discussion will help analyze how the channels you’re currently using can be included in your mobile marketing strategy. Engagement—Provide mobile-friendly content for potential customers who are searching for information about your industry or product. Make sure your website is mobile-responsive to improve mobile SEO. Acquisition—Make sure lead nurturing emails are mobile-friendly with clear calls-to-action. Buttons in emails should be near the top of the message and be big enough to easily tap in order to facilitate click-throughs. Then make it as easy as possible for someone to fill out a form on your mobile-optimized landing page. Customer Service—In a connected, social marketplace, customer service is very much a marketing opportunity. Allow your customers to easily reach you through any platform they want, including simple click-to-call buttons for smartphone users. Do I want to increase conversions from email messages? Am I trying to improve traffic to sales pages? How important is it that I generate more qualified prospects? Does our brand need to improve sales by converting more traffic on certain pages? Mobile behavior data reveals how well your mobile content engages your audience. Mobile conversion data will indicate whether or not some of your key landing pages still need to be optimized for mobile browsing. That information can hint at which search queries may be leading mobile traffic to your site, what content your mobile audience is most interested in, and which pages to optimize for mobile browsing first. Google has even provided a free mobile-friendliness tool to help marketers determine how to best improve their sites. 64% of mobile web users abandon pages if they don’t load within 10 seconds. 35% of executives could not make an intended purchase because the website they visited wasn’t mobile-friendly. 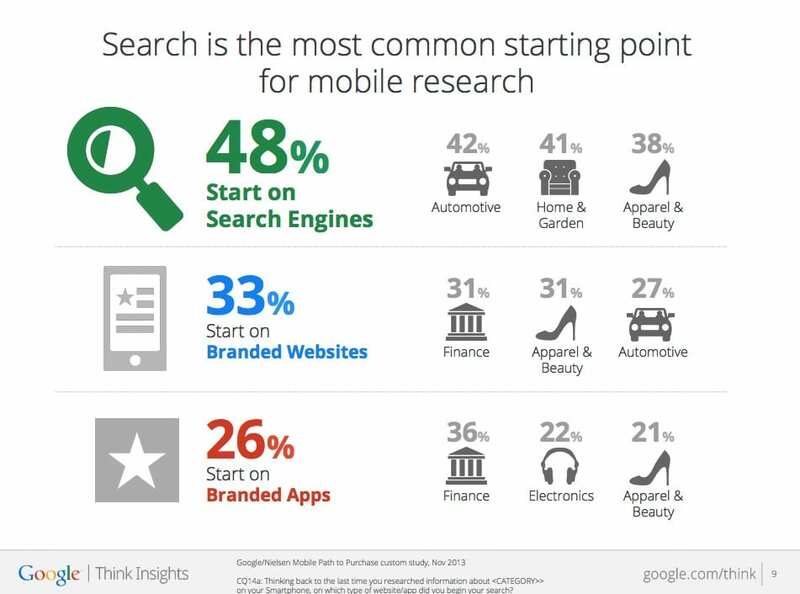 90% of the C-suite uses mobile devices to research business purchases. Making sure your mobile user experience is as easy and seamless as possible should be a primary marketing goal. With 57% of email opened on mobile platforms and 69% of mobile users deleting email that isn’t optimized for mobile, it’s clear that your audience is engaging with email campaigns on mobile devices. Place the CTA early in the message (above the fold whenever possible). Remember that readers are using their fingers to select items. Use pronounced image buttons and keep the layout simple. Keep forms minimal. The fewer fields, the better. Make sure your images are re-sizable for different devices. Verify that the page looks as good vertically as it does horizontally. Not sure where to start with your landing page? Check out these templates for inspiration. Almost 50% of consumers in the U.S. make direct purchases after receiving an SMS-branded text. Keep the text under 160 characters. Don’t use slang or abbreviations. Offer the recipient something of value. Make it clear who is sending the message. Why should you use MMS marketing to reach your mobile audience? MMS texts have a higher customer engagement with a 15% average CTR (click-through-rate). MMS increases campaign opt-ins by 20% over SMS. Subscribers are eight times more likely to share MMS content on social networks. Tie the MMS send to a multi-channel marketing campaign. Make the message easily shareable via social media buttons. Adequate notice—You should inform consumers that they will be receiving SMS messages from a concrete shortcode-based program. Opt-in consent—You must get opt-in confirmation before sending marketing SMS and MMS messages. Online forms to enter your SMS or MMS program requires a double opt-in. Opting out—It should be very clear how someone can opt out of your program. SMS and MMS are very personal, and thus very powerful, mobile marketing options. Make sure to handle them with tact and detailed strategy. Introduce new app features to your users. Send messages to promote engagement with specific content pieces. Drive conversions by delivering targeted CTAs at specific levels of engagement. Both push and in-app notifications can be powerful ways to reach your audience, particularly because they’ve already taken the time to engage with your brand by downloading your app. Mobile is the most personal channel that exists--it's in someone's pocket, sits next to their bed, and is checked throughout the day.This makes marketing on mobile incredibly important but also nuanced. Download this guide to learn how to fine tune your mobile marketing efforts.